On your arrival at Bangalore airport our Dynamic Tours representative will meet you and will transfer you to the hotel.The garden city of Bangalore is the capital of the southern Indian state of Karnataka. Situated at about 1000 meters above sea level. Overnight at hotel. After breakfast drive to Mysore (125-kms / 3 hrs.). Mysore is the cultural capital of Karnataka. It is a majestic, mysterious and mesmersing city. 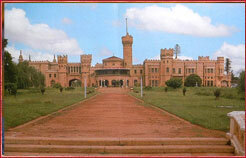 Mysore has a number of historical and heritage building. On arrival check-into the hotel. Afternoon sightseeing of Mysore.Visit Mysore Palace.Overnight at hotel. After breakfast proceed for full day excursion to Ranganathittu Bird Sanctuary. This birding site lush green islands on the river Cauvery. The is is known for migratory birds from Siberia , Australia & south america. It's a grea place to spot Spoon bills, Open Bill Stork, White Ibis, Little Egret, Darter, Pond Heron, Cattle Egret, Cormorant, Wild Duck, Peafowl, large cormorant, shags , river tern, great stone plover, kingfisher, Indian cliff swallow and the lesser whistling teal. Also is offers a great chance to witness Marsh Crocodiles, otters , Flying foxes , bonnet macaque, common mongoose, palm civet. Return back to Mysore. Overnight at hotel. After breakfast drive to Nagarhole National Park enroute visit Srirangapatnam, famous as the Tipu Sultan's former capital, Srirangapatnam is a picturesque island in the Cauvery River. The biggest of the three islands in the River Cauvery, it is about 5 km long and 2km wide. Continue drive to Nagarhole. It is the largest stretch of protected forest in india, the formation of forest is dry scrub - moist decidious with forest of rosewood , sandal , Oak ,bamboo & teak. The park boosts a great variety of wildlife including asiatic Elephants ,tigers, leopards , Gaur , Squirrels, sambar , Chittal , Monkeys , mouse deers, diiferent species of mongoose, monkeys , otters , pangoline etc. Enjoy a wildlife viewing on the afternoon jeep safari trip. Overnight at the wildlife lodge. Morning drive to Bandipur National Park. situated among the foothills of Western Ghat & Nilgiri Mountains, Bandipur has remarkable variety of flora and fauna.This place is home to Leopard , Asiatic Wild Dogs, Stripped Hyenas, Jackals, Jungle Cats, Leopard Cats, Rusty Spotted Cats, Palm Civet, Small Indian Civets, Otters and four different species of Mongooses (the common stripe necked, brown and ruddy mongooses), Gaur, Sambar, Cheetal, Muntjac, Barking Deer, Mouse Deer, Four-Horn Antelope, Pangolin, Indian Porcupine, Fruit Bat, Spender Loris, Langur, Bonnet Macaque, Wild Pig, Black Saped Hare and variety of reptiles such as Rock Python, Cobra, Marsh Crocodile, Monitor Lizard, Rat Snake, Wolf Snake, Common Krait, Runel's Viper Bamboo Pit Viper and Green Keel Back are also found here. 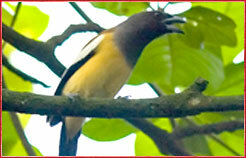 Bandipur is great destination for birding also. Afternoon visit inside the wildlife sanctuary in jeeps. Overnight stay at the wildlife lodge. Morning & evening wildlife viewing and bird watching. Overnight stay at the wildlife lodge. After breakfast drive to Ooty (80-kms / 3 hrs.). Afternoon proceed for the guided sightseeing of Botanical garden, Dottabeta Park and tea plantations. See the beautiful 'Blue hills' of the Nilgiris, go on nature walks along winding roads, see hill slopes covered with greenery and wild flowers, hear the silence of the mountains broken only by the calls of birds and the chirping of crickets, while in Ooty: Stand at the edge of a cliff and see the astounding view of undulating hills and valleys extending as far as the eye can see. Overnight at the hotel. Day 09: Ooty - Munnar After breakfast drive to to Munnar, hill town of Munnar, Located at a height of 1600mts.Munnar town was the summer resort for British. Munnar is the highest tea estate in the world. Afternoon at leisure or free for optional activities - explore the Tea Gardens, Botanical Garden or Ooty Lake. Overnight at hotel. Morning Afternoon drive to Eravikulam National Park to see the Nilgiri Tahr. Eravikulam National Park, The area is tropical evergreen forest. Grasslands, shrubs, and forests are what one finds throughout. Grasslands with patches of forests known as sholas in between cover almost the entire region. This Sanctuary is set up for the preservation of the endangered Nilgiri Tahr. 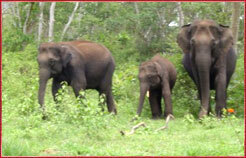 The park home to Elephants, Sambhars, Gaurs, Lion-tailed Macaque, Nilgiri, Langur, giant squirrel, Tigers and Leopards. Overnight at hotel. After breakfast drive to Periyar (3 hrs.) In the lap of the mountains, the Periyar wildlife sanctuary's environ is like a canvas of many shades. The fresh air of the moist deciduous forest gives one a chance to experience the peace and serenity and long to return for more. Periyar Wildlife Sanctuary-Set high in the ranges of the Western Ghats, in God�s Own Country, Kerala, is the Periyar National Park and Tiger Reserve. Periyar wildlife sanctuary has a picturesque lake at the heart of the sanctuary. Formed with the building of a dam in 1895, this reservoir meanders around the contours of the wooded hills, providing a permanent source of water for the local wildlife. Though its a Tiger Reserve, tourists come here to view the Indian elephants in the act of ablution and playfulness by the Periyar lake. Afternoon Nature Walk in Tiger Reserve. The birdlife comprises of Darters, Cormorants, Kingfishers, the great Malabar Hornbill and racket-tailed Drongoes. The reptilian population boasts Of Monitor Lizards that can be spotted basking in the sun, on the rocks along the lakeshore.Overnight at hotel. Morning boating in the Periyar Lake for the best opportunity to see wildlife at close quarters. Visitors who trek into the Periyar national park often see a Python and sometimes even a King Cobra. After breakfast drive to Alappuzha to board the houseboat.Staying in this moving palace is breathtakingly stimulating experience. While sailing through canals one sees different scenes from the villages, paddy fields, coconut palms, fisherman and local life. Lunch, dinner next day breakfast and tea snacks will be provided in the boat. The cool breeze from the Lake make you sleep early in the night after anchoring in a fancy place.Dinner and Overnight in the houseboat. Day 14: Kumarakoram Disembark your houseboat at Kumarakom and visit Kumarakoram Bird Sanctuary, located on the banks of the Vembanad Lake, the bird sanctuary is spread across 14 acres. The Kumarakom Bird Sanctuary, an ornithologist's paradise is a favourite haunt of migratory birds like the siberian stork, egret, darter, heron and teal. Overnight at hotel. Day 15: Kumarakom-Cochin Morning drive to Cochin. Arrive Cochin & check into the hotel Afternoon start sightseeing trip of Cochin: Visit Dutch Palace, with its murals from the Ramayana, the Jewish Synagogue in Mattancherry and St Francis' Church in Fort Cochin. This evening enjoy a Kathakali performance, a traditional dance form of Kerala. Overnight at hotel. On time transfer to airport to board flight for home.